This book is a Young Adult Book. Ages 12 on up will love this fantasy! Light strobed through the edges of the blinds like a flickering neon sign, thunder rolled incessantly, and rain pounded the roof. Allan snapped out of a cozy dream. Startled, he pulled the covers to his nose as his eyes darted to the window. Heavy raindrops nicked the window panes like tiny knives, as if something wanted in his home, something bad. Right outside the window, a bolt of lightning nailed the old oak tree that crowded the front yard and blew apart the thick trunk in a brilliant display of sparks. The slightly parted blinds remained still, but beyond the glass there was an energy, an energy so violent it threatened to tear the house apart, brick by brick. Orange light danced in between the slats; the tree outside the window must be on fire. He was too old to be so afraid of lightning, but never before had he seen its awesome power so close. The trunk of the tree shattered under its weight, sounding like the crack of a hundred whips, and toppled onto the house. One of its branches smashed through the window unleashing the roar of the storm into the bedroom. The branch ripped off the blinds, and rain and wind gushed inside, frightening away any lingering warmth or security. Something else was out in the storm, coming for Allan, like beasts at the door. The air seemed electric as it clawed its way over his body, icy like dead fingers. In between the rumbling of the giants in the clouds, Allan heard a whirr. It was eerily familiar, and it frightened him. But he couldn’t advert his eyes from the gaping hole where the window once was. Something tore its way through the storm, heading right for him. A metal arrow shot through the window, slammed into the carpet with a force that would kill an elephant, and buried itself in the carpeted floor. A thick, black cable was attached to the arrow, and it led out the window and up into the dark, stormy night. Allan leapt to his feet and flew backward in a leap, smashing against the door. A scream poised at the back of his throat remained pent-up, caged like a frightened animal. His hand reached behind and seized the door handle, and it wouldn’t turn. He wrenched, but it was no good. Shadows moved all around, like angry bats, and the rain continued to flood the carpet of his room. Allan froze, pressed hard against the door, his breath trapped deep in his lungs. The whirring sound grew louder, like the engine of a helicopter. A figure slid down the cable, holding onto a pair of handles. The figure, backlit by the burning tree, jumped like a gymnast, landed on Allan’s math textbook and stumbled. Allan recognized the voice immediately, but it couldn’t be her, it just couldn’t. He released the door handle and hesitated for a split second. Could it be? He flipped the light on. Asantia stood in the middle of his wreaked and flooded room, balancing on one leg while massaging her ankle. It is her! Allan gasped and felt goose bumps rise on his skin. Dizziness replaced the terror he’d felt a moment before, but it was fleeting. The light illuminated the flying things, which were simply leaves blown around by tornado-speed winds. Outside, the intense rain put out the last of the fire that had scorched the old oak tree. Asantia grinned and held out her hands, palms up. “What, no hug?” She wore gray leather boots and tight black pants with throwing knives strapped to her thigh. Her long-sleeved orange shirt had ruffles on the cuffs and around the low-cut neckline, and a thick leather belt sat high on her hips. A strap crossed her chest holding a large sword to her back. Allan knew the sword and how sharp the blade was because she’d held it on him when he first met her. Asantia was tan and had little scars on her neck and cheek and one across her hand. All in all, she looked the same as when Allan left her on Lan Darr at the travel gates guarded by Lyllia of Meduna only four months ago. Allan rushed into her arms and hugged her tight. It had been four long months since the flash flood that almost killed Rubic, Allan’s uncle. 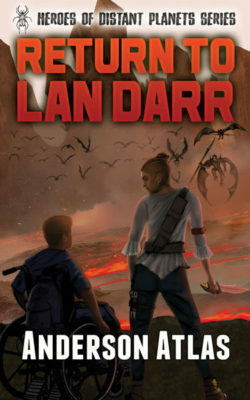 Four months since Allan had to crawl through the forest to get help and ended up on another planet, the planet of Lan Darr. Asantia had threatened to sell Allan into slavery but had later saved his life and become his friend. He’d learned that her edgy persona was just a front, a mask that kept her safe in a tough world. She was really very smart and compassionate. Oh, and beautiful too. She couldn’t have been more than a couple of years older than Allan, but even she didn’t know her exact age. She’d appeared on Lan Darr as a baby, her mother and father nowhere to be found. Asantia smiled. “Well, I’m so sorry to come early. Maybe I should go.” She turned to the shattered window and the heavy, splattering rain. The thunder was farther away now, the rain less intense, and the wind died down, letting the leaves settle. Allan surveyed the sopping wet carpet, the broken glass, the tree branches, and the broken blinds. It was serious damage. Uncle Rubic would not be happy. Asantia sat on the edge of Allan’s bed and clasped her hands together. “This isn’t a social call.” Water soaked Allan’s blanket. “Revenge on Mizzi?” Allan asked. Allan’s forehead furrowed. This was definitely not a social visit. He looked away from her, his jaw tightening. Allan glanced at his legs. They were working, healthy and strong. “Awe man, this is a dream.” Never in his life had a dream felt so real. The memory of Jibbawk and the evil Killian Crow made him shake and sweat, but still, he didn’t want to wake up. He wanted to see Asantia again, to explore distant planets with her. Asantia handed the smooth box to Allan. Allan turned it over and over. He didn’t know what to do with it. “I forget you’re from Earth.” Asantia emphasized ‘Earth’ like it was an insult, but she smiled. Allan peered through the slit. At first it was only darkness. Asantia took the box and shook it lightly. The next time Allan looked inside he saw a light spark. The spark caused two sparks which led to four, which led to eight. The chain reaction continued exponentially until the box was filled with light. In that light, a picture formed. He could see huge rocks and outcroppings. Some of the stones resembled honeycomb structures. All the rocks were covered in thick black moss or algae. The sky was light blue like Earth’s, but there were no plants on the surface, only acres and acres of moss. The camera moved over a large stone. “Who’s holding the camera?” Allan asked. Allan watched the recording. The calibrut scuttled around as quickly as a cockroach. It approached a vast shoreline where large waves crashed into the rocky beach. Plethiomia seemed like a desolate place. The calibrut paused next to a large boulder, then moved over the rock slowly. There was Jibbawk. It was on its back with its arms splayed out, looking dead. Jibbawk, when Allan had run across it in Lan Darr, was a ghost who was made up of thousands of black beetles. In an effort to capture Jibbawk, Mizzi delivered Jibbawk’s preserved body to the ghost. The beetles vanished, and Jibbawk’s flesh and bones awoke. Jibbawk looked like it did now: dark, thin, bird-shaped, long sharp beak, eyes with vertically slit irises, spines like porcupine quills, and thin, strong legs like an ostrich. Allan didn’t think anything could look more frightening than the beetles, but he was wrong. Jibbawk’s real body had an edge to it, a hardness that made it look tough. Its eyes radiated ruthlessness. It was a killer, through and through, and now it seemed unstoppable. Banishing it to Plethiomia was only a minor inconvenience, not a death sentence. A dark, round object peeked out of the waves. So the planet wasn’t desolate after all. The object had no eyes and no visible mouth or nose. It watched Jibbawk closely. Then, it hurled out of the water, a serpent body trailing behind it. Its round head opened up, exposing not teeth, but sinewy, stringy filaments like the inside of a pumpkin but without the seeds. Moments before it came down on Jibbawk, Jibbawk’s quill-covered arms sprang up and impaled the serpent’s mouth. Jibbawk leapt to its ostrich-like feet and grabbed the creature by the neck and dragged it off the beach; all the while the serpent squirmed and flailed around like a fish out of water. Jibbawk stabbed another quill into its head and waited for the creature to die. He tore a chunk of flesh off the serpent’s back and another chunk off its side like a giant piece of string cheese. Blood, as black as ink, splattered everywhere. Allan gagged for a moment, but continued to watch. Jibbawk strung the chunks of flesh on a thin, flexible root it pulled from the ground. It walked over to a fire pit and with two rocks, sparked a fire and began to cook the meat. The offshore wind picked up and blew snow flurries onto the moss-covered land. Jibbawk held its hands near the flames to protect it from going out. The spikes on its arms fluffed up, attempting to block the wind. After Jibbawk devoured the serpent meat, it curled up next to the embers of its fire and slept. Snow built up on the beach and on its shoulders and back, but it didn’t seem to care. Allan looked away from the box to Asantia who was trimming her nails with her sword. “It’s nighttime,” Allan said. “Oh.” She slipped her blade-of-doom in its sheath and took the box. She shook it once, peeked into the slit, and then shook it once more. “Come on, hurry up,” she mumbled to the box. “The nights on Plethiomia don’t last long.” She shook the box two more times then handed it back to Allan. Allan watched the sunrise on Plethiomia. A glowing ball, about half the size of Earth’s sun, rose from the ocean-side horizon and melted the snow, exposing the algae. He watched Jibbawk wake, kick the fire pit apart, then follow the shoreline. He was about to shake the box to speed up the recording when a light in the sky caught his eye. The light resembled a meteorite as it burned through the atmosphere. Instead of extinguishing or slamming into the surface, it stopped. It was a huge spaceship. Jibbawk saw the ship and waved its spike-covered arms over its head. The ship floated toward the shore. It resembled an egg and was as tall as a skyscraper, though much wider. There were no windows or doors or flaws in the polished surface. When it approached the beach, it separated in the middle. The gap widened and was dark inside. Daylight spilled into the interior, illuminating antennas and a tangled mess of pipes and superstructures as dense as a city. A smaller landing ship shot out from a dark space. It, too, was white, but it looked like a boomerang. It swooped in a wide arc, unfolded four, thin landing legs, and then set down on the beach. A platform separated and lowered to the moss covered rocks, holding a thin being that had long spindly fingers, large eyes, and a bulbous head. Its nose and mouth were small, and it wore a white robe with a stiff collar that stood up and concealed its neck. Jibbawk rushed to the being and fell to its knees, holding out its hands. The being accepted Jibbawk onto the platform and the two were lifted up into the ship. The wing-ship rose off the beach and headed back to the mother ship. The video box showed the smaller aircraft approach the large gap in the mother ship. The image zoomed in. The bottom platform of the wing-ship lowered then was ripped away by the wind. The thin being in the white robe fell from the hole, along with two others in similar robes. They flailed all the way to the ocean where they hit with a powerful splash. The wing-ship turned from the mother ship and flew in the opposite direction. He had no idea what else he would see, but watched anyway. The calibrut slowly made its way to the camp. It inspected serpent bones strewn about. Allan’s stomach clenched because the bones were covered in maggot-like worms, puss and dark blood. Jibbawk’s quills were shed about in the depression lined with small round stones that made up its bed. Allan gasped as the calibrut zeroed in on the fire pit. The blackened stones that circled the fire pit had scratches on them. They read, ‘Kill the boy’ carved over and over again. ‘Kill Asantia’ was carved into others. Another read, ‘Eat them for dinner’. Allan’s heart turned icy cold. When he handed the box to Asantia, she took it and tucked it into her pack. She did not smile or react in any way, allowing the realization to sink in. Allan was in danger. Asantia put her pack on and stood. The gloom of the rainy night and the dim bedroom littered with shattered glass and sopping leaves surrounded her, punctuated her hard, serious stare. She reached out for Allan’s hand, but he didn’t take it. He stared at the dirt under her fingernails and the scars across her hand. She didn’t shake or move in any way. She was a buoy in a chaotic sea, one that Allan could grab ahold of and survive the storm. Finally, after a long while, Allan took her hand and stood. “You will help me hunt him,” she said. Allan knew he would. It wasn’t about right or wrong or if he could really help her. It was because he had no choice. “What do we do first?” he finally replied.